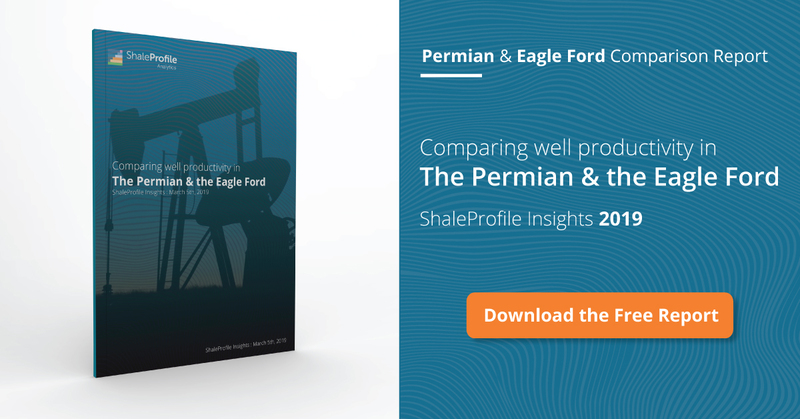 This interactive presentation contains the latest oil & gas production data through April from 20,207 horizontal wells in the Eagle Ford region, that started producing since 2008. Despite significant future upwards production revisions, which are typical for Texas, it appears that total oil and gas production has declined in the Eagle Ford since December. It also appears that the wells that started producing in 2018 are so far closely tracking the performance of wells from last year (see the ‘Well quality’ tab). However, on closer inspection (by selecting to show wells by ‘Quarter of first flow’), you can see that there were some minor improvements since the 2nd half of 2017. All leading operators have been unable to grow production here since early 2015, although EOG is close to its previous high (‘Top operators’ tab). Devon Energy shows the largest decline among them, with a ~60% drop. For example, the 1,850 horizontal wells that started in 2011 (represented by the red curve) are now at an average rate of 15 bo/d, after having recovered 130 thousand barrels of oil and 0.8 Bcf (switch ‘Product’ to gas to see this). Based on average cumulative production in the first 2 years, Devon Energy is still showing the best results (at 220 thousand bo/d) of the operators with at least 100 wells, while EOG is the number 5 (‘Productivity ranking’ dashboard). Later this week I will have a post on all 10 covered US states, followed by an update on North Dakota early next week. ShaleProfile Analytics, an online portal with similar user-friendly dashboards as shown here on the blog, but with new dashboards, and access to more up-to-date data, such as lateral positions, proppant loadings, and lateral lengths. You can request here a free trial. ShaleProfile Data, where you can subscribe to our underlying data platform, and receive monthly updates with the latest data. You can bookmark https://shaleprofile.com/blog/ , if you wish to get quick access to the latest blog posting here. Please tell me what you like and especially don’t like about this new setup! Why does the Eia have the Eagle Ford producing almost 1.45 million barrels of oil per day? It sure looks like the Eagle Ford will be luck to produce 1.25 million barrels a day even with the updated data in about a couple of months. I have always thought that the EIA has be overestimating the Eagle Ford and I think they will have to continue to correct down there estimates for the Eagle Ford. 3. The EIA also models incomplete/missing production data, while I just report what the Texas RRC reports (which is known to be incomplete, especially for the recent 3-6 months). The job present a clear picture about Eagle Ford unconventional reservoirs developed with long horizontal wells and multifracture. The services offered from Enno Peters are even more valuable on unconventional development. One thing is very clear on Eagle Ford unconventional reservoirs, the initial production rates are improved every year. This is related with increasing the well length, the number of fracture and the fracture solution volumes and composition plus the volume of propant. These can be seen on two services Enno Peters provide. On addition to these, the wells on Eagle Ford pay produce for many years, but we see that within 7-10 years the wells are stripper wells and these wells have very high cost on production if the operators will keep on production for long time.